-Seeing Sir Terry’s sword that was made out of the meteor he came across. Here be the sword – best shot I could take at it. 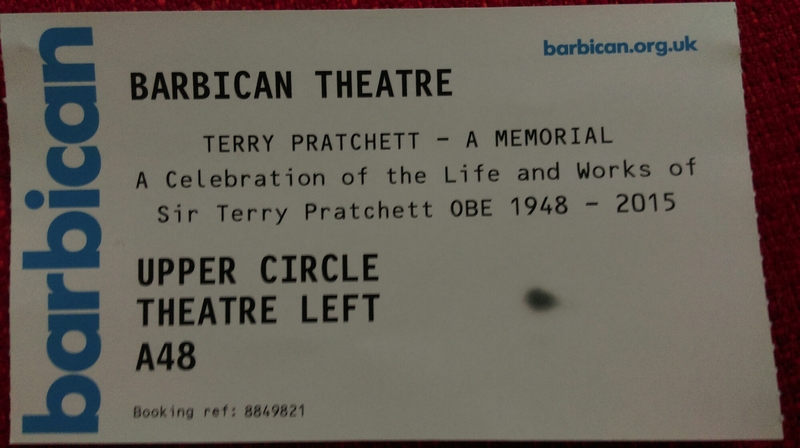 Yesterday evening we had the infinite pleasure to assist the Terry Pratchett memorial at the Barbican Theatre (London). A very selective event, kept very hush-hush, but magical nonetheless. We cried as much as we laughed through the nearly 3 hours the celebration went on for. There was a choir, and Steele Eye Span played a few songs, as Terry liked them very much and was friends with them. Stephen Briggs welcomed us all while impersonating Lord Vetinari. Rob Wilkins was more than a host or presenter; he acted like a dear friend to the audience, sharing experiences, comments and anecdotes from his time with Terry. Many of the author’s friends came to the stage: publishers, editors, colleagues, it was a wholesome symphony of praise, respect and love for one of Britain’s most popular and beloved writers. Everyone had kind words for him not only as a professional, but as a person. Rhianna Pratchett came to the stage to share her memories of him as a father, privilege she has only amongst anyone.